I was very curious about whether Content blocking scripts in iOS 9 will go mainstream. Content Blocking (in the form of Adblocking) has been around forever in desktop, but has largely remained in the “nerd” / “geek” territory. Most people didn’t care enough as there was no immediate / tangible benefit for the effort involved in installing an adblocker extension (even though installing one is not all that hard). Only 5% of all Internet users had an ad blocker installed. However on mobile, there are tangible benefits promoted by ad blockers. * Reduced bandwidth costs * increased battery life). Ad-blocking app Crystal claims 3.9x times faster load and 53% lesser data use on the Top 10 popular news sites, Still it is an opt-in and a two-step installation process. The installation process is similar to that of custom keyboards, and in my experience most mainstream users had not both installing custom keyboards. Content blocking scripts are off to a strong start. 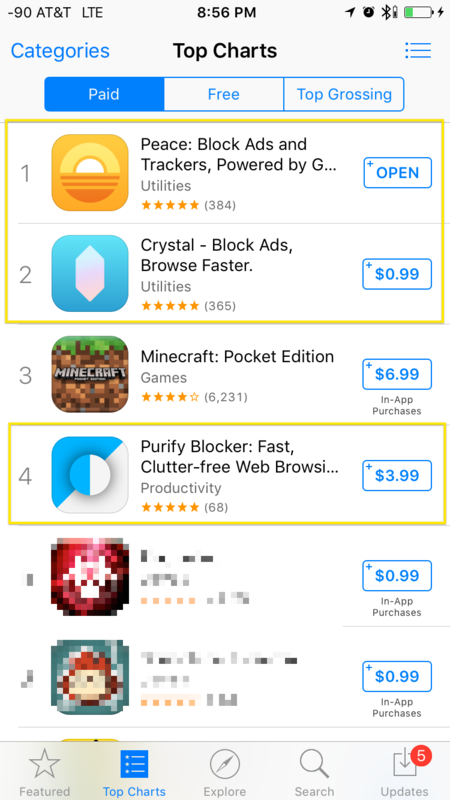 Three of the Top 5 Paid apps are content blocking scripts. That is really strong considering the payment hurdle and the installation hurdle. 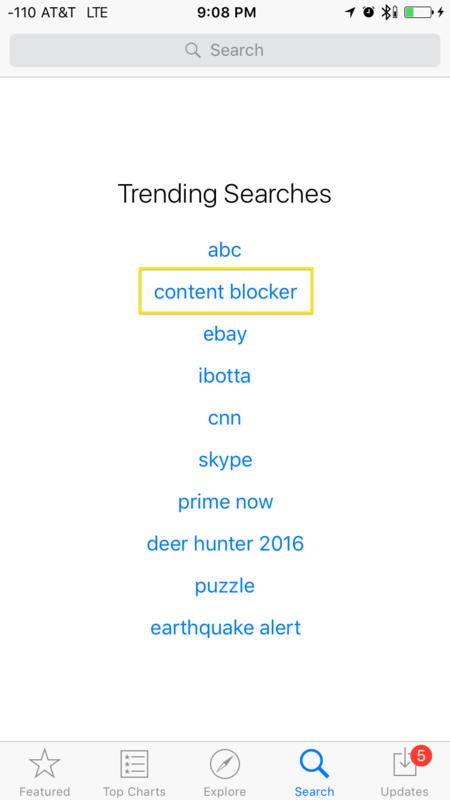 Content blocking is also a trending search (which presumably will drive install to free ones too). I am definitely surprised by this trend. I was somewhat skeptical about the adoption of these types of apps, but it looks like there might be enough momentum for this to go mainstream. (It’d be interesting to know if custom keyboards were trending ever in the app store, especially in the early days of iOS 8 due to the curiosity factor). The takeaway for PMs is that if you address a real problem (like bandwidth costs or battery life), users may be willing to take an obscene amount of effort to use your solution. Painkillers, Vitamins yada yada yada. 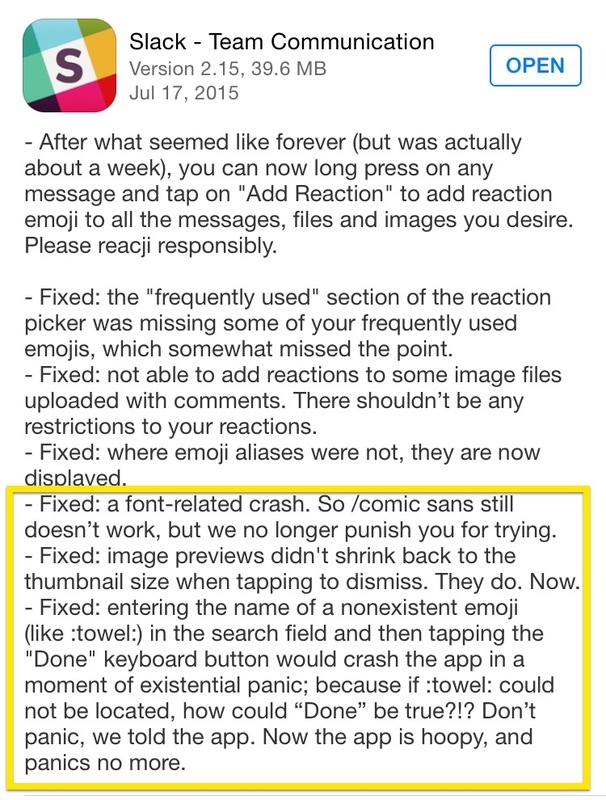 It is not new that app developers tend to show some personality in their release notes (I am really curious how many “regular, non-nerds” read those anymore). 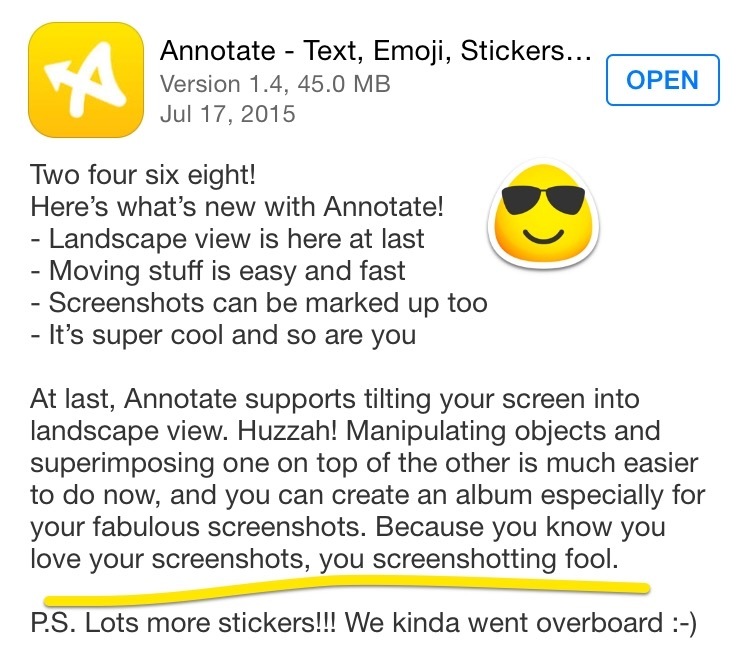 However, I saw a few awesome examples of app developers taking extra care about their craft and showing some love in release notes. All these apps were updated in the past two days, and all this awesomeness got me excited enough to write a post about it, after a long hiatus! That is how excited I got! 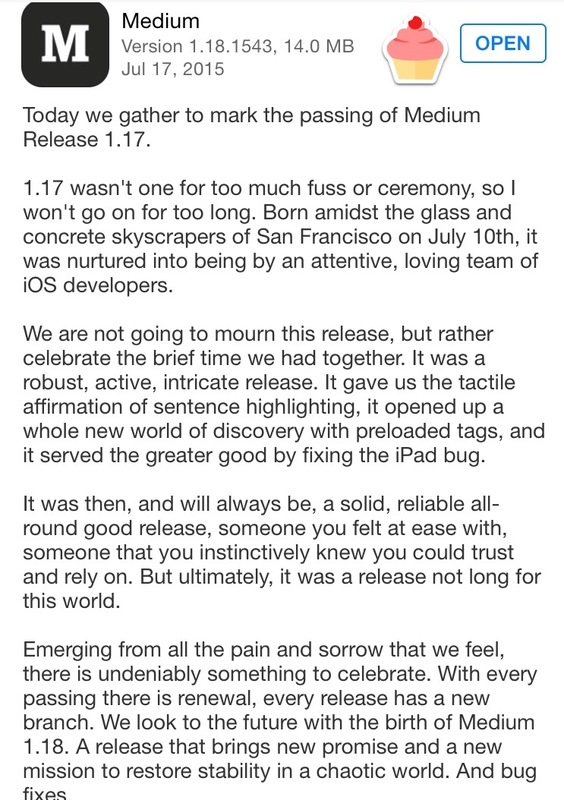 The Medium app seizes your attention by starting on a somber note. Very creative. 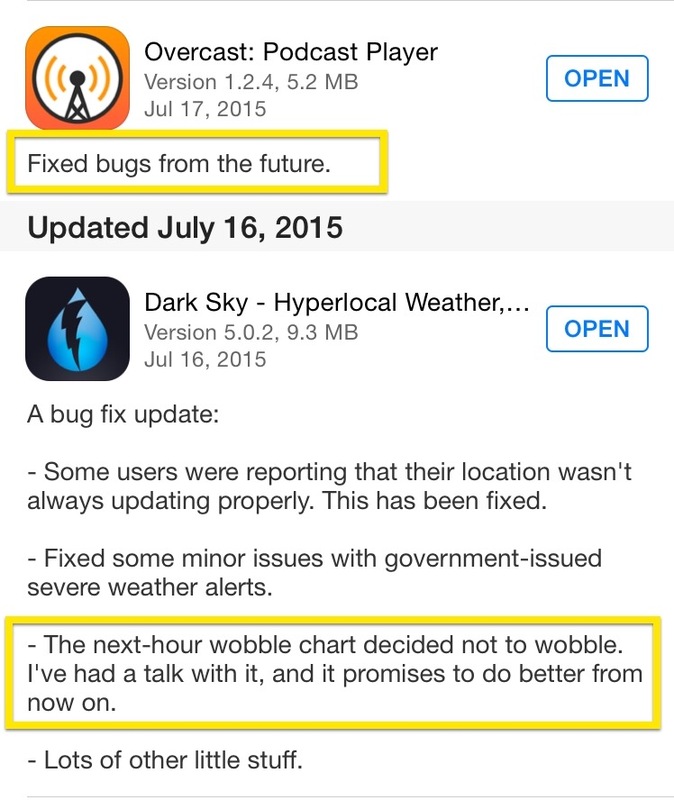 Overcast, with a short and sweet reference to bugs in iOS 9 and Dark Sky having a talk with charts that wobble. 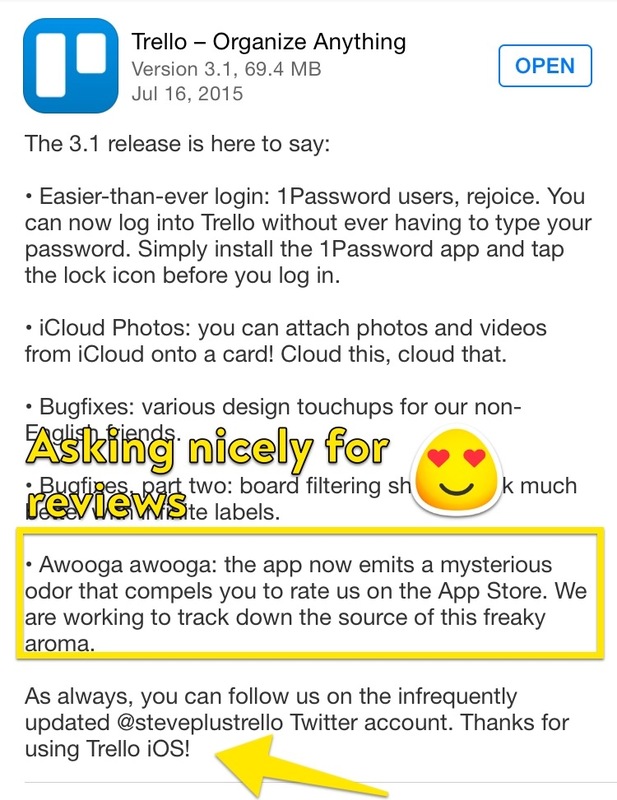 It is also nice to see people asking for reviews nicely in release notes, as opposed to interrupting the user’s flow inside the app. In a world of auto-updates, If a user is interested enough to read your release notes, they are quite likely your more engaged users, who are arguably more likely to take the time to leave a review for you. (or atleast tweet about it). Reading the 37Signals blog post about picking a theme for the new year rather than a resolution really resonated with me too. 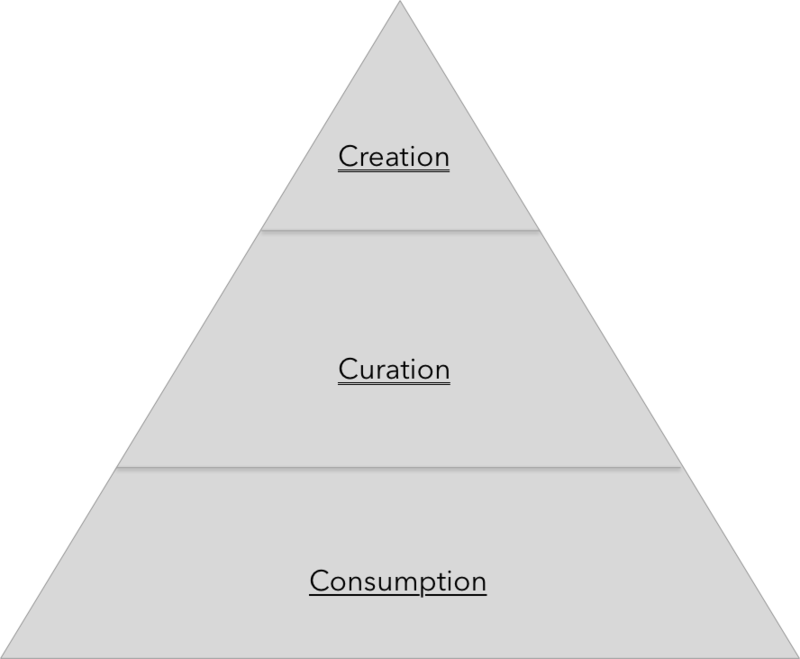 If you think about “Stuff” (content / knowledge work / whatever), there is a hierachy of Creation, Curation and Consumption. I’d give myself a 9/10 in Consumption, probably a 6/10 in curation and a measly 3 out of 10 in Creation. This year, I want to change that. I want to get more deliberate about curating and do more creating. Great advice for entrepreneurs and Product Managers from Startup L Jackson. In effect he asks us to come up with a framework that guides/informs your intuition. Keep refining the framework everytime you meet someone new! And there are a few specific examples of how you can keep refining it based on who you meet. Ask everyone you meet what they believe, and why. When you’re talking to your Cousin Eddie, ask him about his favorite apps. How does he buy stuff? Does he watch YouTube? How does he find new restaurants or plan his travel? How does he advertise his small business? When you meet other founders, ask them how their business works. Treat them as experts with insights that can help you improve your framework. Who are their customers? What do their customers love about the product? What have they tried that customers hated? How do they explain the product to customers? They’re building a marketplace, cool! How much do providers have to make to stay engaged? How many uses before a buyer sticks? And if you have an area you’re working, talk to customers. Every day. Talk to users of your product, active, inactive, new, and old. Talk to people who don’t want to use your product. 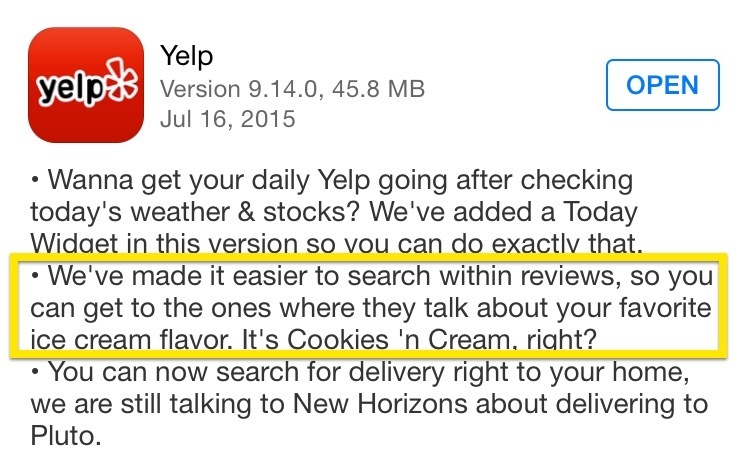 Talk to people who are using a competitor’s product. Talk to customers of products in adjacent markets. Now, reread this paragraph and replace talk with listen. I saw this article on HBR (it is from last year). It is meant for “nice people”, but I think these are just as applicable to Product Managers, who often need to wield influence without authority. As a PM, you need to be comfortable with a healthy level of conflict. Healthy Conflict is a sign of passionate people who stand for something. If you are not getting push back on your ideas, you may be settling for mediocre local maxima. The secret of having healthy conflict and maintaining your self-image as a nice person is all in the mindset and the delivery. To start shifting your mindset, think about your value to the team not in how often you agree, but in how often you add unique value. May Sound cheesy, but this is a flavor of the Yes And Principle in Improv. Ask for help. Another tactic for “nice conflict” is to be mildly self-deprecating and to own the misunderstanding. The wrong way to be a hero is by avoiding conflict or “taking one for the team”. Don’t be that kind of a heroic PM. © 2016 Anand Rajaram. Pixyll Theme courtesy of John Otander.